Quoth Dave Lowum: "Those breakers are gonna trip faster than the town drunk." Time to get thee a RacPac. And a deeper rack. Too cheap to put two more screws in the upper front blank panel? Here's mine, front (rear to follow). The band logo plate replaced a DRPA moved to FOH. And the logo plate is currently replace by a dbx223XL crossover (spare/aux fed subs). 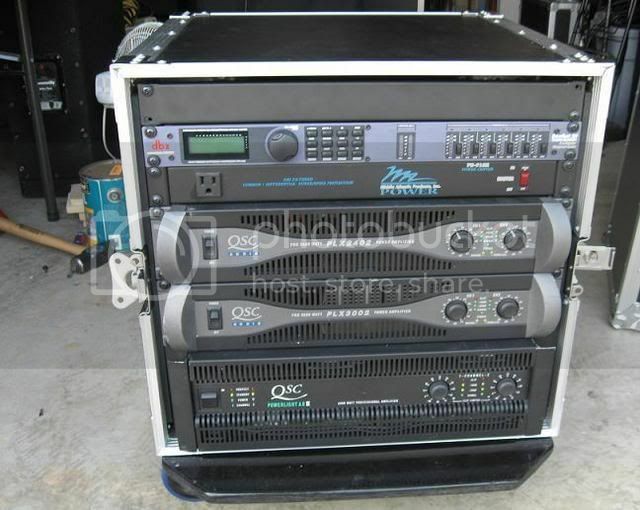 DRPA will return to amp rack when upped to 10RU and FOH upped to 12RU from the current 10RU. Of course not. Its just a temporary place holder until I put a new toy in there. 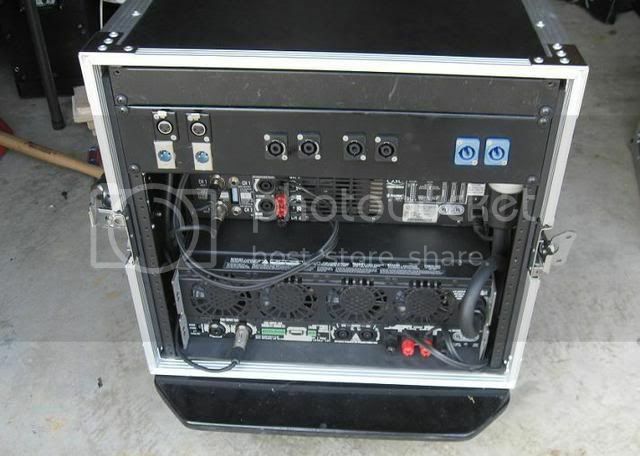 Amp rack rear. Had to add a 5th input for subs when I moved the DRPA to FOH. DRPA to return to amp rack soon, along with the dbx223Xl crossover I have as a spare and for future Aux Fed Subs.I picked up several short IEC large gauge AC cables from www.stayonline.com to clean up rack AC routing. Hard to see the labeling above the I/O panel from the glare. Two of the speakons route both top and sub signals on their 4 contacts. Cool, looks just like mine.